PcVue 11.1 is the latest release of PcVue SCADA solution created by ARC Informatique. It now features the monitoring of geographically distributed assets and IP network devices. The innovative design improves operator effectiveness with powerful data analysis tools and developer productivity with advanced automation of configuration. GEO Map Control, a built-in component for GIS decision making, provides live interactive maps from popular mapping services such as Google and Microsoft. Maps are interactive and dynamic; supporting both off-line and on-line maps access. PcVue graphical objects (Symbols) may be used as markers including animations and display of real-time asset status and alarms. No scripting or programming is required to configure the Map Control. PcVue's communication driver pack, CIMWay, has been expanded to support SNMP for monitoring and controlling devices on IP networks. This native capability not only allows PcVue applications to monitor the health of the network, but provides access to an ever increasing number of IED's and other equipment with IP interfaces. Designed for optimization of large IP networks in mind, the PcVue SNMP solution capability supports the growing Internet of Industrial Things (IoIT). 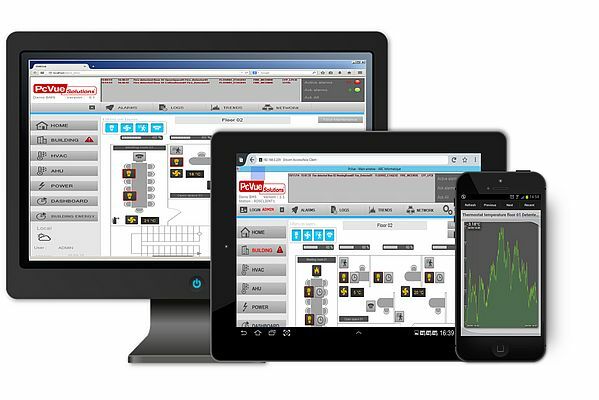 Data Analysis for operator decision-making support is an increasing requirement in a modern SCADA application. PcVue 11.1 provides powerful analysis, with a few clicks operators may move from real-time to analysis mode and back. The resulting visualization may be with dashboard KPI displays or the powerful new X-Y charting control for correlation and statistical analysis. Enhancements to BACnet® Scheduling and new SMART Generators for BACnet® and TwinCAT® - Beckhoff for automated configuration are some of the many additional new features and improvements to PcVue Solutions with PcVue 11.1. Other additions are worth to be noted: the implement of a new license utility, a unique tool for license management, and improved client drivers for Energy management such as DNP3, our DNV Kema certified IEC 61850, IEC 60870-5-104, etc. To preserve your SCADA investment and ensure its longevity, PcVue has been maintaining backward compatibility for 20 years. This new version is compatible with the latest technologies (Windows 8.1, Microsoft SQL Server 2014, etc.) including virtual environments.